Aid Cargo – what is it? This photograph is an example of the sort of aid cargo we fly to people affected by disasters. If you donate to us, you may have helped us deliver it. Thank you so much. Why not get in touch and say how you feel! Flour, salt and cooking oil are the basics for survival. There was plenty of water around, it was a flood after all. And cargo includes giving these needy people water purification tablets, so that’s not the problem! Carbohydrate, salt and oil for cooking are the problem. 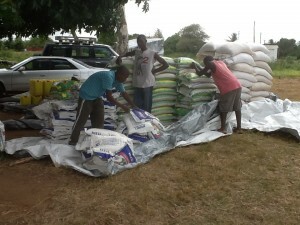 The Mozambican government and other donors provided the flour, oil and salt; we just delivered it. All disaster response is that sort of team work. But getting the aid to needy people, that’s what Wings Like Eagles aims to do. That’s what we call aid cargo. We also call it ‘lifesaving’ because that is what it is! Why not watch our video of what we did? So what aid cargo have we delivered? In 2013 we supplied the people of the villages of Zimelene, Chilaulele and Mahielene when they were cut off from all other forms of supply. Here’s what the professionals said about the disaster. Or here’s what the media said. We supplied them with enough aid cargo to tide them over. Until the roads dried out and the bulk aid could get in. Until they could start to access their own reserves and until they could get back on their feet. Aid cargo is just part of what a helicopter can contribute to disaster response. Another response is surveys, which help target the limited funds most effectively. Also we can fly VIPs to help inform government decision making. And we can fly the media so that we all can see what has happened and donate if we wish. Helicopters can be really useful. Have a think about donating to help us continue to do this sort of work, using our trusted channel to deliver aid to the needy.